A few steps from the sea, the Hotel Beaurivage is a 3-star family-run hotel in Rivazzurra. The hotel is equipped with: parking, WI-FI, air conditioning, services for children. Pets allowed of all sizes. 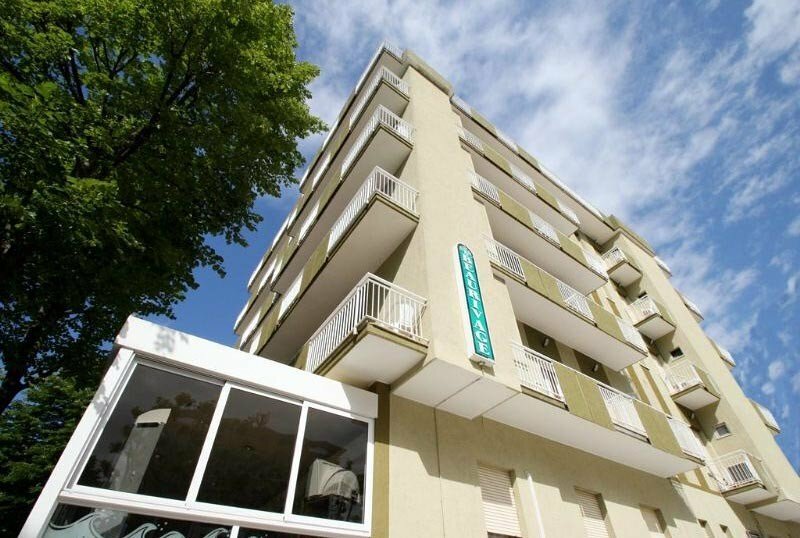 The Hotel is located a few steps from the seafront and Rivazzurra beach, a tourist resort south of Rimini. The hotel is located in a side street of the promenade, a quiet and quiet avenue but at the same time close to the area full of activities, clubs, shops and restaurants of all kinds. All rooms have a balcony, air conditioning, WI-FI, digital terrestrial TV, telephone, safe, private bathroom with free toiletries, hairdryer and shower (in almost all rooms). On request: rooms with sea view and minibar. Equipped open-air porch, reading room, lift, laundry on request. Every week the staff organizes a Sunday aperitif and dancing evenings. PARKING: uncovered and covered, both available subject to availability. CONVENTIONS: beach, theme parks and discos. On request organized excursions and shuttle service. Free entry to the Beach Village waterslide. BREAKFAST : buffet with homemade desserts, cakes, croissants, fresh bread, jams, seasonal fruit, cereals, yogurt and cold cuts. LUNCH AND DINNER: every day dishes of meat and fish, the best recipes of the Romagna tradition and tasty international dishes served in the air-conditioned dining room. Water, wine and soft drinks at meals. VARIATIONS : vegetarian and celiac cuisine (both on request). In hotel: baby sitter and pediatrician, both on request. The structure has an agreement with the equipped beach Bagno Dino n. 114, here hotel guests can take advantage of the many services offered including cabins, entertainment for adults and children, playground area, fitness area and playgrounds. Formula Full Board: water + wine with meals, air-conditioned beach. The prices are per day and per person for a minimum period of 3 days. City tax not included. - 6 to 10 years -20%. - Single room + € 8,00 per day. All Inclusive: full board, water + wine with meals, air conditioning, parking, beach umbrella and lounges at the beach and an hour of free canoe or pedal boat at the beach. - Special agreement with the Water Park Beach Village Riccione. - For those who want to take advantage of the All-Inclusive contact the hotel directly for a quote. Special offer August and August in Rimini! From 1 to 08 August in All Inclusive Formula starting from € 56.00 per person per day, for a minimum stay of 6 days. Offer for the price of 35 € per day per person in a Superior room. Hurry! Promotion valid for the last available rooms. Request a custom quote and book your stay!